Those fans never had to listen to “Duets”. I consider myself a fan, but “One More for the Road” with Kenny G. was just a little too much. Still, I’ve made similar threats in defense of Dylan or Van Morrison. Or at least day dreamed about making them. Question, if leaving such comments is wrong, do you take that to confession? Or if you take it to confession, is it scrupulosity? Yes, Kenny G was out of his depth on that one, and I’m a fan. But it was nice of Sinatra to let him try. I don’t think it is scrupulous to admit excessive attachment to one’s musical tastes to the point of belligerency. Every decent musician is going to have periods that should be forgotten. Some are longer than others. Some are able to crash and burn and then rise from the ashes. Others just get lost down the rabbit hole (Miles Davis). I think Frank just held on a leeeetle too long, which explains the Duets albums. True enough, but I still get excited when his (Davis’) version of “TIme after Time” or “Human Nature” comes on the radio. I never bought the album (You’re Under Arrest? ), but I ripped the Montreaux versions from YouTube. What radio are you listening to? Local Jazz station, KPLU, streaming at http://jazz24.org/. For awhile it seemed like the MD version was in heavy rotation (which I like very much). 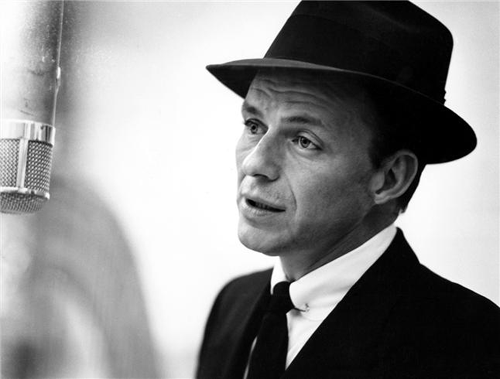 I’ve heard a lot of Sinatra there as well, though never Time After Time. Nor have I heard Davis doing a version of Sinatra’s song, nor Sinatra doing the Lauper song—which would have sounded like a cruel joke, I think. I like the Lauper song a lot, especially Davis’ live performances, but the Cahn/Styne song is on an entirely different level. My original point was that Davis could have played “Sugar, Sugar” by the Archies and wrung real feeling out of it. Sorry for the bait and switch, Big John. Everybody. Time After Time is one of Sinatra’s best. Will check out the Davis version. Thanks. All I’m getting is a vesion of Lauper’s song with the same title. Very nice, but the one I’m looking for was written by Sammy Kahn. I just thought it was kind of funny that there is a version of Miles Davis doing the Lauper version. If I were Sammy Cahn, I’d be kind of pissed. I knew it was “Cahn”, so why didn’t I doublecheck. He was the Chairman of the Boards.